Small, reliable cars are plentiful. Most automakers offer a couple of small cars for customers to choose from, but few of these vehicles are anything to write home about. The majority of affordable sedans and hatchbacks are unexceptional and give you little value for your hard-earned dollar. The Toyota Corolla and Hyundai Elantra are two exceptions and happen to be among the most popular small cars around. Still, no two cars are created equal and, for 2018, the Toyota Corolla is the compact car you’ve been looking for. Even the base-level Corolla comes loaded with advanced technology and important features that the Elantra simply can’t match. 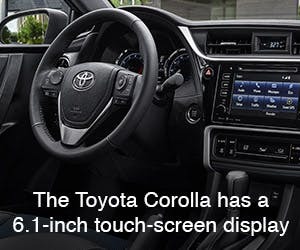 It’s hard to call it “base” when the Corolla gives you a 6.1-inch touch-screen display, Bluetooth, a USB port, a six-speaker audio system, a rearview camera, voice recognition, and Siri Eyes Free which allows for voice control of an iOS device using the in-car audio system. If you’re looking for similar features and technology in your Elantra, you’re going to have to pay. “The Corolla has a clear advantage over the Elantra when it comes to features and equipment ... By contrast, the base Elantra is very sparsely equipped. It includes just a six-speaker audio system, Bluetooth, and a USB port." Toyota takes safety incredibly seriously, and that’s easy to see when you get behind the wheel of the 2018 Toyota Corolla. 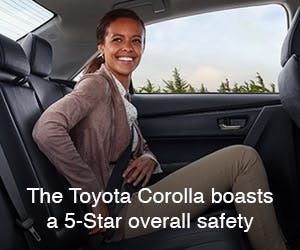 All Corolla models come with Toyota Safety Sense (TSS); this is a suite of advanced safety features aimed at making your drive easier and safer. TSS features forward collision warning, automatic emergency braking, pedestrian detection, lane departure warning, lane keep assist, adaptive cruise control, and automatic high beams. There’s little wonder the 2018 Toyota Corolla has received a 5-Star overall safety rating from the National Highway Traffic Safety Administration (NHTSA). The 2018 Elantra sedan in comparison has been flagged by the Insurance Institute for Highway Safety (IIHS) for a less-than-impressive side-impact test. How much weight that goes into a reputation is up to you, but the Corolla has more than just a reputation. 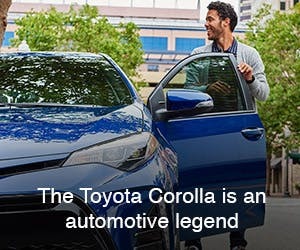 No, the Corolla is an automotive legend. Since it was first released in 1966, the Corolla has consistently been one of the most popular cars in the world. When you get behind the wheel of a Corolla you know you’re going to be driving a reliable, fuel efficient, safe automobile. It will get you where you want to go and never complains. Beyond bragging rights, the Corolla has decades of improvements and advancements in its DNA. That’s a lineage the Hyundai Elantra simply can’t compete with. Now that we’ve highlighted some of the benefits of the Toyota Corolla, why not take a test drive and experience the car for yourself? There’s no obligation to buy and it’s the only way to know if the 2018 Toyota Corolla is the right car for you.